Here’s a list of the most commonly asked questions. In case, you can’t find the answers you need, view our Terms of Service. There are 3 ways to order. Please note that we usually cannot reply immediately once you send us a private message, email or text message. If you are in a hurry, we highly recommend that you take the time to order directly from our website. 3. Order via cash on delivery. For cash on delivery (CoD) orders, please send us a private message in FB, email or text message and we will provide you with a website link where you can place your CoD order. How to order if I want to pay via cash on delivery? 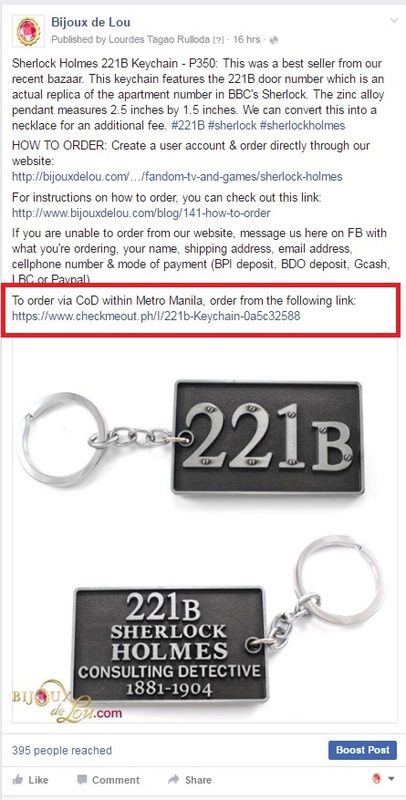 Bijouxdelou.com is partnering with Checkmeout.ph to provide cash on delivery option for clients in Metro Manila and from nearby provinces (Bulacan, Rizal, Cavite and Laguna). Checkmeout.ph is owned and operated by LBCX which is an affiliate of and the IT Services and E-commerce arm of LBC Express Inc.
Orders via cash on delivery take 3-6 business days to deliver ( Day 1 starts the next business day after we have confirmed your order for pickup). 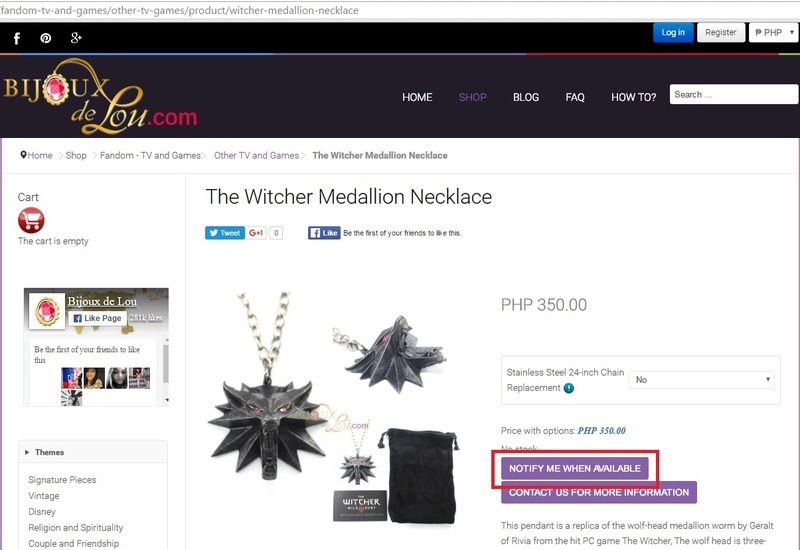 To order via checkmeout.ph, we will provide links in our facebook listing for each item. 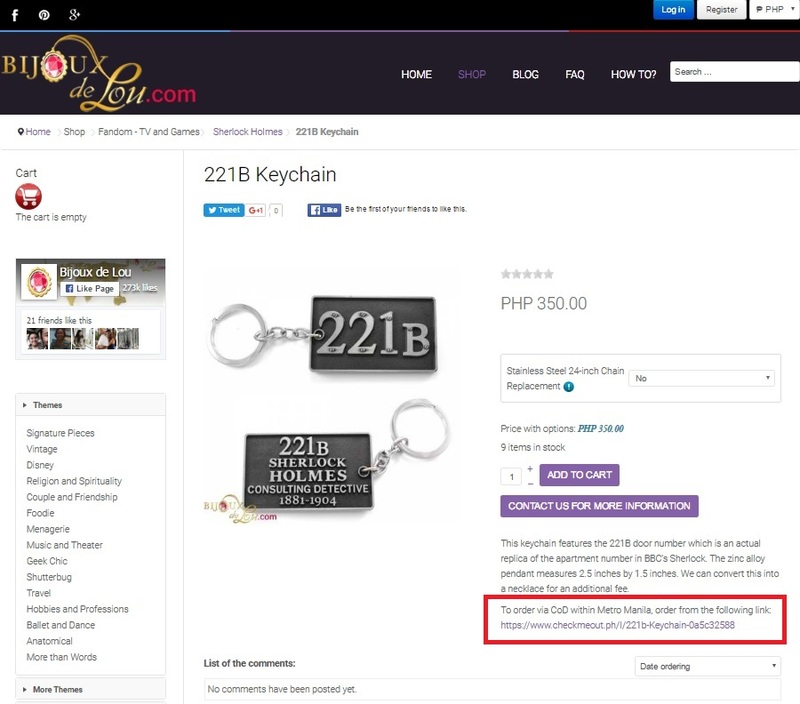 We will also include these links in the product description of our items in our website as seen in the screens below. Yes, we can do meetups for transactions over P3000. We have full-time jobs unrelated to running this site and so we have the minimum purchase amount for meetups to make the meetup worth the time spent away from our day jobs. If you purchase amount does not reach P3000, you can either have it sent via courier or pick the item up from our Rosario, Pasig warehouse. Once we have the information above, we will provide you with our address and map to our warehouse. You can also check out the many feedback of past clients about us which our clients posted on their own free will. There are even some feedback way back from 2009. If you are using facebook with free data, you can see client testimonials by clicking posts to page (in the red box) as seen in the attached photo. If you wish to purchase items personally, you can do so by purchasing the item from our Rosario, Pasig warehouse. Alternatively, you can visit us at one of the many bazaars that we participate in Metro Manila. Our next bazaar will be in Novmeber 2016. Please follow us and subscribe to our events so that you are informed of our upcoming bazaars. Can I pick up and pay for the item directly at your warehouse? Yes, you can but you need to schedule a visit. Once we have the information above, we will provide you with the complete address and map to our warehouse. It is necessary that you schedule a visit because our warehouse does not have a showroom and it is better that you inform us ahead of time when you plan to pass by and what items you are interested in so that we can manufacture (or get the items out from boxes) before you drop by. We accept the following modes of payment from Philippine customers: BPI deposit, BDO deposit, Gcash, LBC and Paypal. We accept Paypal from international customers. As we strive to keep our prices low, they do not take into account Gcash cashout fees and Paypal transaction fees. Customers then shoulder these fees, which are automatically added to the total. The Gcash cashout fee is equivalent to 2% of total due. The Paypal transaction fee is equivalent to 4.4% of total due plus P15 or US $0.30. Client pays first before we ship orders. Payment is due three days (excludes Sundays) after order submission. Are there payment fees that I have to pay? Yes. There are payment fees that you need to pay. Paypal charges us tranasaction fees when we receive payment into our Paypal account. This is equivalent to 4.4% of the total due plus Php15 or US $0.30. When you pay via Paypal, we add Paypal transaction fees to your total. Globe G-cash charges us cashout fees equivalent to 2%. Hence we add 2% of your total to cover the Globe G-cash cashout fee. If you live outside of Metro Manila and you were to pay via BDO bank deposit, BDO will charge you P50 as remittance fee. You will be paying BDO this fee directly. If you were to pay via LBC, LBC will charge you a remittance fee. I do not have a bank account nor credit cards. I just have cash. How can I pay? You can still pay via BPI or BDO bank deposit even though you do not have a bank account. What is this LBC Send and Swipe account that I need to send LBC remittance to? There are 2 ways to remit money to us via LBC. One is via card loading to our LBC Send and Swipe account. The other is via LBC branch pick-up also known as IPP (Instant PesoPak). For LBC branch pick-up, we will have to physically go to an LBC branch and retrieve your payment. It is a cheaper option to our clients. The remittance fee is P3 for every P100 (for remittance amounts below P1000). Your remittance is immediately loaded into our account. We can ship your package 1 day after you have shown us proof of payment. 100% more expensive than LBC card loading. The remittance fee is P6 for every P100 (for remittance amounts below P1000). There will be a delay in shipping your package since we will retrieve your payment first before we ship your package. If you do not mind paying a higher remittance fee, feel free to send us LBC IPP payments. Do you accept Cash on Delivery (CoD) payments? Cash on delivery is possible only within Metro Manila and nearby provinces (Bulacan, Rizal, Cavite and Laguna). We partner with checkmeout.ph (owned and operated by LBCX, which is a sister company of LBC) to provide cash on delivery service. Since we partner with a 3rd party for CoD, we add P100 to the price of your order (for order amounts P1000 and below) to cover all CoD related fees. Also, delivery via CoD takes 3-6 business days from the time that we have confirmed your order for pickup. You can read more about cash on delivery in the following link. We ship throughout the Philippines via LBC and Xend Express. We ship worldwide via Sweden Post or Singapore Post. Within the Philippines, we employ Xend Express and LBC Express to deliver your packages. For clients abroad, we employ Singapore Post or Sweden Post. Shipping and packaging is additional and is dependent on your address and chosen courier. We ship throughout the Philippines via Xend Express and LBC, and worldwide via Sweden Post or Singapore Post. If via Xend Express, shipping and packaging starts at P90 within Metro Manila (1-2 business days) and P130 to areas outside of Metro Manila (3-6 business days). If via LBC, shipping and packaging starts at P165 within Metro Manila, P185 within Luzon, P195 within Visayas and Mindanao. LBC ships in 1-2 business days. For international clients, we ship via SingPost's premium registered airmail. A 100 gram package and below will cost between P250-P300 (US$5 to US$6) to ship and will take 7-15 business days to deliver. We ship 1-2 days after payment verification. LBC can deliver in 1-2 days wherever you are in the Philippines. Xend Express can deliver in 1-3 days within Metro Manila and 3-6 days outside of Metro Manila. For example, if you pay on Monday, we will ship Tuesday. If you choose LBC as your courier, your package will arrive Wednesday at the earliest. If the courier is Xend Express, your package is insured up to P2000 at no additional cost to you. You can purchase additional insurance for P1 for every P100 added value. If the courier is LBC, your package is insured up to P500 at no additional cost to you. You can purchase additional insurance for P5 for every P500 added value. Packages shipped via Sweden Post and Singapore Post are not insured. We have never lost a package that was sent abroad. However, we have had packages returned to us because the destination address was incorrect or incomplete (for example, no PO box number for addresses in the Middle East). Please make sure that your address is correct. We have trained our support team to verify international addresses before shipping your order. What happens when my package is lost? If your package is insured, we will contact the courier and have them investigate the circumstances of the loss. If the courier admitted that the package was lost because of their error or negligence, we will immediately ship a replacement. The investigation normally lasts a week after a loss is reported. Do I have to pay for the shipping fee for every item that I order? 1. packed in sturdy boxes which are bought by clients as part of the shipping and packaging fee. 2. received damaged and when the nature of the damage is such that it cannot readily be fixed. For example, a loose jump ring or hinge can easily be repaired with long nosed pliers. Shipping the damaged item back to us and shipping the replacement item will all be at our expense. If there is no suitable replacement for the damaged item, we will grant the customer store credit which can be used towards a future purchase. Note that rings that do not fit the client is not considered as damaged. Damage due to misuse and reaction to very acidic sweat are not covered by this policy. 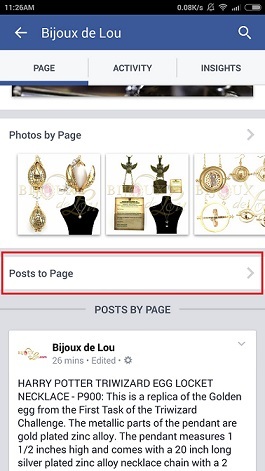 Fastest way to check for availability is to check our website at http://www.bijouxdelou.com. Our website contains real-time stock level of all our products. Your website indicates that the item is out of stock. Can you notify me when the item becomes available? Yes, we can notify you via email. Due to the numerous requests for notification for product availability, we have automated this process so that you are sent an email once we have restocked the item in our website. You can add yourself to the notification list for an out-of-stock item by clicking the NOTIFY ME WHEN AVAILABLE button as seen below. If you cannot go to our website, you can send us a private message in facebook with your name, email and the item that you want to be notified once it is in stock. Check out the link below to determine your ring size. Welcome to our jewelry box filled with whimsical and nostalgic pieces. In this online store of ours, we open to you the treasure trove of trinkets that we have found through our travels. We offer a wide variety of costume jewelry that include never used, vintage lockets; bracelets & necklaces designed with genuine vintage & contemporary charms; statement piece cocktail rings; and artisanal brass jewelry.On 2014, we started offering fandom jewelry. 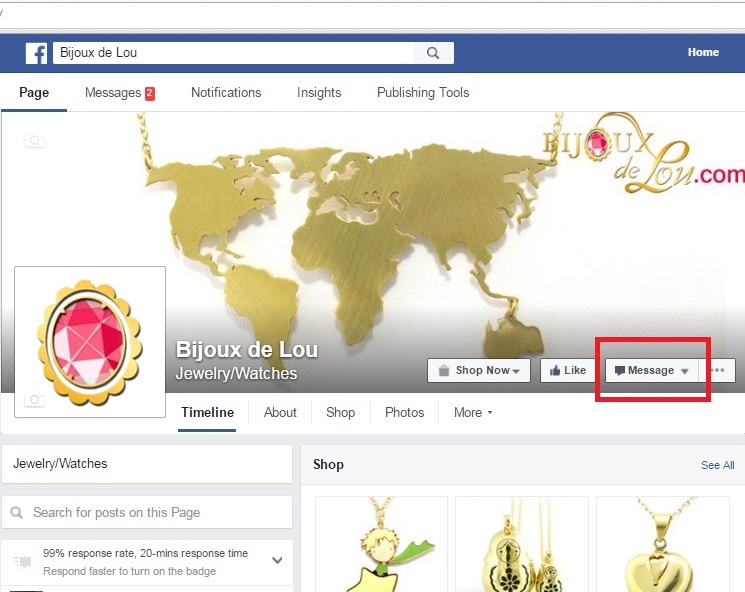 You can send us a private message at our Facebook fanpage at http://www.facebook.com/bijouxdelou. To send a private message, click the "Message" button found in our cover page (in red box in the photo below). Please note that we have day jobs and may sometimes be unavailable to take your call. If you are unable to call us, please send us a text message and we will reply back as soon as we can. We prefer that you read the client testimonials about us and you decide for yourself.